↑ १.० १.१ राना, भवन सिंह (2004). 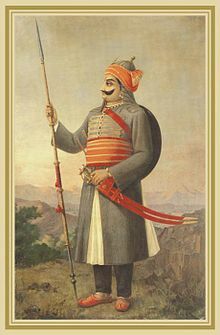 Maharana Pratap [महाराना प्रताप]. डायमंड पोकेट बुक्स. pp. 28, 105. आइएसबिएन 9788128808258. http://books.google.co.uk/books?id=K0UnRk-rRa4C. ↑ Köpping, Klaus-Peter; Leistle, Bernhard; Rudolph, Michael, सं (2006). Ritual and Identity: Performative Practices as Effective Transformations of Social Reality. LIT Verlag Münster. प॰ 286. आइएसबिएन 978-3-82588-042-2. https://books.google.co.uk/books?id=BkBh1Nl4dHwC&pg=PA286. ↑ Rana 2004, pp. 28, 105. ↑ Sarkar, Jadunath (1994). A History of Jaipur. प॰ 48. आइएसबिएन 978-8-12500-333-5. ↑ Daryanani, Mohan B. (1999). Who's who on Indian Stamps. प॰ 302. आइएसबिएन 978-8-49311-010-9.